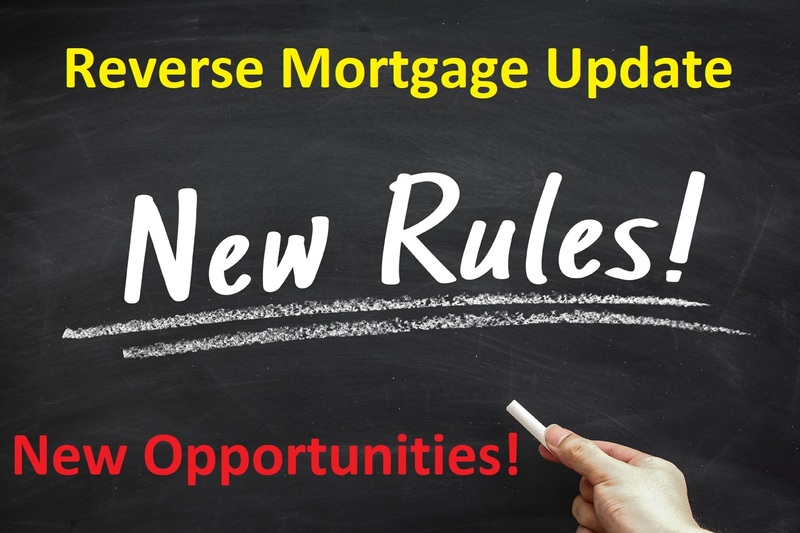 New Reverse Mortgage Rules Means New Opportunities! On October 2, 2017 major changes to HUD’s Home Equity Conversion Mortgage (“HECM”) program, also known as Reverse Mortgage, officially went into effect. The new Reverse Mortgage rules offer opportunities for many would-be reverse mortgage borrowers. The new reverse mortgage rules are especially conducive to borrowers over the age of 62 seeking to use a Reverse Mortgage to purchase a property. Reverse Mortgage for Purchase is becoming an extremely popular tool as it allows borrowers to purchase their “Forever House” without the need to worry about making payments on the principal and interest of the loan (however, borrowers would still be responsible for property tax and insurance payments). Another benefit of using the Reverse Mortgage for Purchase program us that the income requirements used by the Reverse Mortgage program are less restrictive than conventional forward loans. Since many borrowers over 61 are retired and are on fixed incomes, their purchasing power utilizing forward loans is limited because they find it difficult to meet the rigid debt-to-income ratios required by forward lenders. The solution: Reverse Mortgage for Purchase. The new rules are especially friendly to these Reverse Mortgage for Purchase borrowers but are also EXTREMELY attractive to borrowers seeking a traditional Reverse Mortgage refinance. First, the new rules lowered the one-time upfront mortgage insurance premium from 2.5% to 2% which comprise part of the closing costs associated with Reverse Mortgage loans. For example, if a borrower is purchasing a $500,000 home, under the old Reverse Mortgage rules the one-time upfront mortgage insurance premium would be $12,500 (or 2.5% of $500,000). Under the new Reverse Mortgage rules, the one-time upfront mortgage insurance premium would be $10,000 (or 2% of $500,000). So the new Reverse Mortgage rules saved the borrower $2,500. Second, the new Reverse Mortgage rules lowered the yearly mortgage insurance premium from 1.25% to .5%. This decrease in the ongoing yearly mortgage insurance premium is also a HUGE change in favor of reverse mortgage borrowers. The third major change to the reverse mortgage program was a downward adjustment of the principal limit factors (“PLF”) used by the reverse mortgage program. While on its surface this may appear to be a negative change, what it actually does is help preserve a borrower’s equity by limiting access to the amount of funds a borrower is eligible to borrow. In other words, a borrower will be able to borrower less but preserve more. All 3 changes are a plus to would-be reverse mortgage borrowers. In summary, the new reverse mortgage rules 1) Lowered the one-time upfront mortgage insurance premium from 2.5% to 2%; 2) Lowered the ongoing yearly mortgage insurance premium from 1.25% to .5%; and 3) modified the reverse mortgage PLFs. If you or someone you know is considering a reverse mortgage in the near future please tell them to call Frontier Loan Group, Inc. Michael Gaddis, J.D. is the CEO & Broker of Frontier Loan Group, Inc. He is a frequent speaker on the topic of reverse mortgages conducts reverse mortgage workshops throughout the State of California. Michael Gaddis, J.D. has extensive experience working on more challenging reverse mortgage scenarios. For more information please call Michael Gaddis, J.D. today at 760-692-5950 or email Michael Gaddis, J.D. at Michael@FrontierLoanGroup.com. Frontier Loan Group, Inc. CA BRE #01449152 NMLS#345305 Michael Gaddis, J.D. CA BRE #01433800 NMLS#280011. For more information on Frontier Loan Group, Inc. please visit http://www.FrontierLoanGroup.com or visit Frontier Loan Group, Inc.’s YouTube page at Frontier Loan Group You Tube. This entry was posted in Blog and tagged changes to reverse mortgage rules, HECM for purchase, HECM mortgage insurance, HECM rules, mortgage insurance, new HECM rules, new reverse mortgage rules, pros and cons of reverse mortgage rules, reverse mortgage for purchase, reverse mortgage MIP, reverse mortgage refinance rules. Bookmark the permalink.